In the pure world of hygienic, diaphragm valves are essential for safe and reliable production. In order to ensure sterile and non-contaminated products it is important to rely on high quality diaphragm valves designed according to your use case. That is why Bürkert offers a broad range of diaphragm valve solutions (control, on/off and hygienic speciality valves) to fit your individual needs. 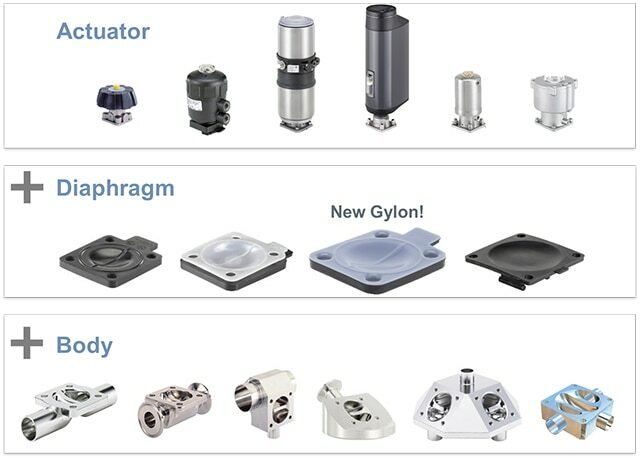 Configure your valves from the very best ingredients of actuator, diaphragm and body from a single source with proven Bürkert quality. Choose the innovative Tube Valve Body for example and regain production time due to shorter heat-ups and cool-downs. You can combine it with your desired diaphragm and actuator. Bürkert diaphragm valves support you achieving your economic targets. Due to optimized geometries in our forged bodies the flow coefficient is up to 35% higher than the industry average (see Kv values in illustration). This leads to less pressure needed to push liquids through the valves and to an increased diaphragm lifetime. Furthermore, it makes smaller pumps with less energy consumption sufficient. 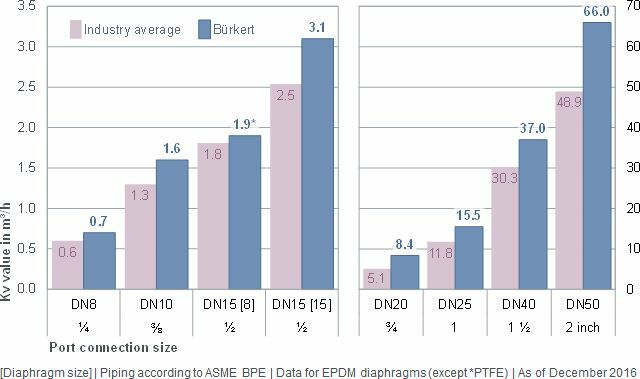 So increase your flow with Bürkert’s diaphragm and save operation costs. Be assured that our diaphragm valves and automation know-how, no matter the challenge, provides added value for you.